Acknowledged author David Epstein wrote Business Structures (American Casebook Series) comprising 600 pages back in 2015. Textbook and etextbook are published under ISBN 0314287035 and 9780314287038. 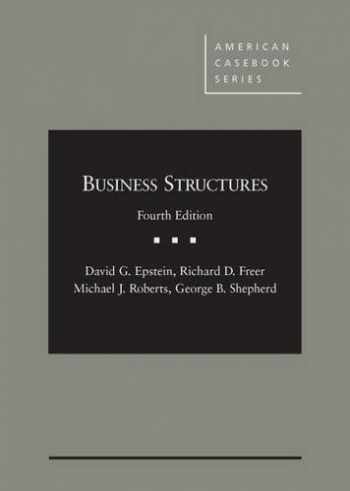 Since then Business Structures (American Casebook Series) textbook received total rating of 3.5 stars and was available to sell back to BooksRun online for the top buyback price of $69.52 or rent at the marketplace. This book makes the Business Associations or Corporations course accessible to students whether or not they already know anything about business. In a conversational tone, the original text and problems emphasize the legal issues that 99% of lawyers will encounter in their professional career. The book is organized around the life-cycle of a business. And while it includes landmark cases, the focus is on the legal issues encountered when starting a business, growing a business, and ending a business. This is the only current casebook for an introductory course in business associations that is co-authored by a business school professor. The book thus consistently and clearly provides students with the business context for understanding the legal issues explored.